Mt. Gunstock Ski Hoist, Inc.
Mt. Gunstock Ski Hoist Inc. Many thanks to Phil Cooke, whose father, Ted Cooke, founded this area in Gilford. It was the first rope tow (or as Cooke called it, a Ski Hoist) in New Hampshire, and one of the first in New England. It was also, as far as we can tell, the longest rope tow ever built. At 3100' long - it was longer than many chairlifts today! 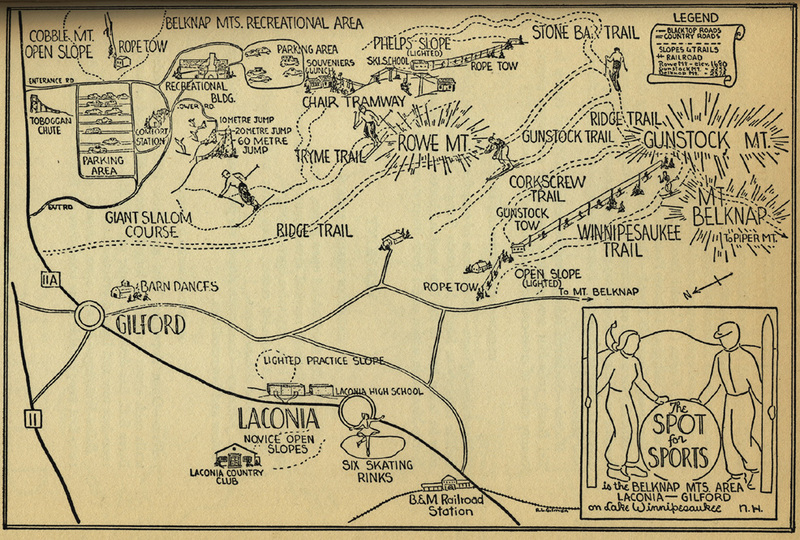 There were some early trails on Gunstock Mountain in the 20's and early 30's, but like all trails at that time, none were lift served. 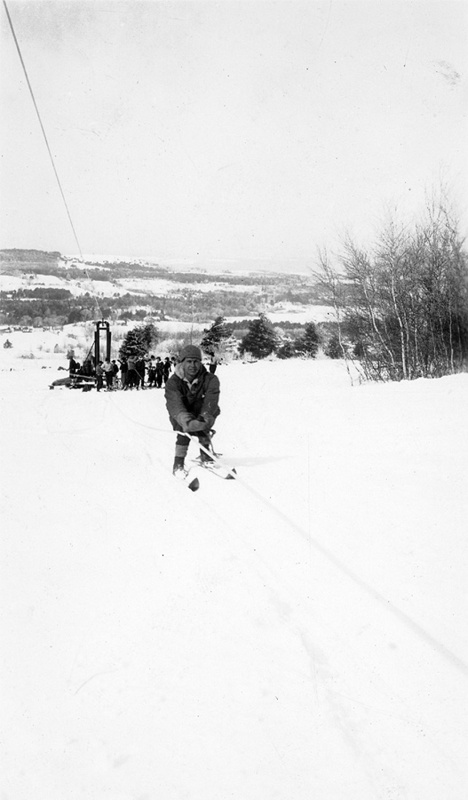 During the 1933-1934 season, Ted Cooke visited the first rope tow at Gilbert's Hill in Vermont, and liked what he saw. He realized that uphill transportation for skiers was the future. Ted decided to open a ski area. He looked around at several areas, but decided on Gunstock. It was close to Boston, and had a good profile to build a ski area. Cooke built a 3100' long rope tow in the fall of 1934. Two trails were cut - Corkscrew and Winnipesaukee. The area opened on January 27, 1935. During the first season it became clear that skiers could simply not hold onto a rope tow for 3100'. It was a fast tow as well, 20-30mph - imagine trying to hold onto it! So, Cooke decided to come up with a tow gripper, which he patented in 1937. In 1938, a single chair opened on the other side of the hill at Belknap Ski Area. This was a huge development in local skiing. The Belknap area grew steadily for several years. 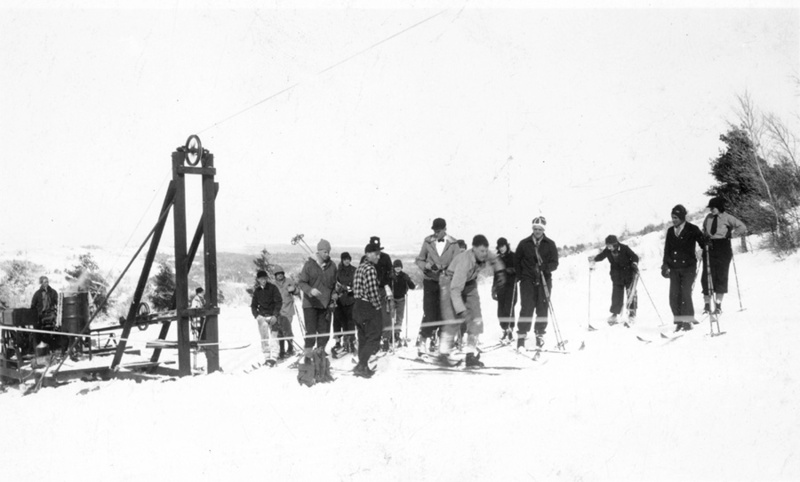 At some point in the late 1930's, another rope tow was added for a beginner slope at the Mt. Gunstock Ski Hoist. 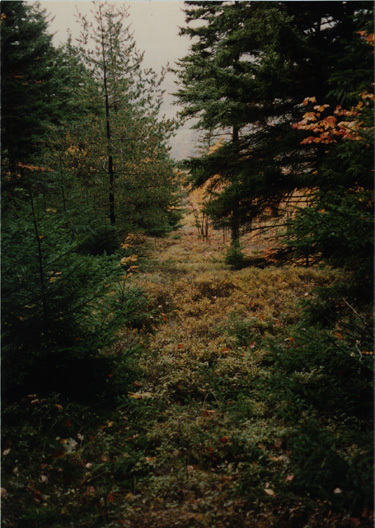 Winnipesaukee Trail: 3/4 mile long, 30-60 feet wide, 30 degree grade. 1150 feet vertical drop, needs 18" to ski, expert. Corkscrew Trail: 3/4 mile long, 20-75 feet wide, 15 degree grade, 900 feet vertical drop. NW Exposure, needs 12" to ski, intermediate. Both above trails served by 3100 feet long rope tow. Also 800 feet long rope tow serving a beginner slope which was lighted at night. On the right is a trail map showing the ski area, on the right. Note the proximity to the Belknap area. Click on image for larger version. Unfortunately, the area closed after the 1939-1940 ski season. This was due to Ted Cooke's family obligations, along with the competition from the larger development on the other side of the mountain. The ski hoist was moved to the Commonwealth Golf Course, where it operated for several decades. More information will be added to the NELSAP Commonwealth page soon. Today, both trails and the open slope have grown in tremendously. However, the lift line can still be followed. The handle was manufactured by the blacksmith at the family owned stone quarry in Swampscott, MA. It was an ungainly hunk of metal. Sometimes the handle would not release from the rope at the top. After going around the bull fly wheel it would fly off in all directions. Someone could get seriously injured by the flying handle. Fortunately this never happened. Needless to say the handle was not a commercial success. The safety switch was an interesting affair. It was a board located horizontally halfway up the rope tow from the skier exit point at the top and the fly wheel up on a pole (a telephone pole, actually). The idea was that if you could not detach yourself from the rope you owuld come in contact with the safety board which subsequently shut off engine. It was called the bang board. My father used to say that if you hit the bang board you may be unconscious but you would be alive. 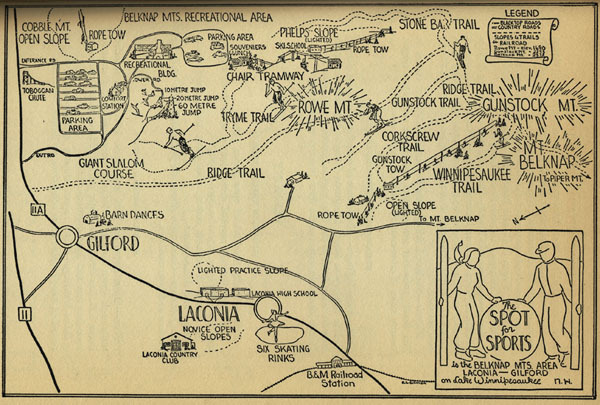 One of the ski trails was called Winnipesaukee. I don't remember the names of the other two. One can still make out some of the trail lines even though the overgrowth is 60 years plus old. After 5 or 6 years of operating the tow or ski hoist as my father called it, my mother got tired of my father taking off every weekend to run the tow. Even though she was a skier she was also bringing up four children. Therefore the tow was sold to a Mr. Lawton in 1940 and relocated to Newton Commonwealth Country Club just over the city line from Boston. Looking down the tow line from halfway up. 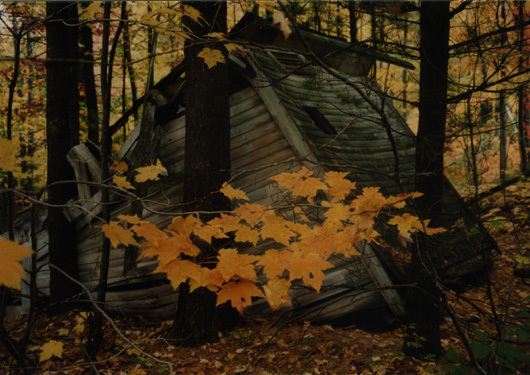 Remains of the warming hut. Phil (on the left) and his son Jon at the warming hut. Ted Cooke wrote a great article in Appalachia magazine in November of 1935. Read it below. His predictions for the future of skiing are very interesting! Skiing seems to be entering a new era - a time when it will be possible to do much more skiing in a given length of time. When we were youngsters, we would tow a sled energetically up a slippery hill only to slide down the same course in about 1/10 the time. We outgrew this sport because the more mature mind could not see enough pleasure measured in terms of work. This is probably the reason more people do not ski today. Until recent years skiing equipment was not good enough to practice the art properly. Now, however, our equipment is perfected for all practical purposes, and we can look for only minor improvements in the future. It is no longer necessary for us to congregate at a few congested places to ski. We have plenty of good trails for our present needs and we can easily find any variety of skiing we wish. To make skiing as enjoyable in this country in this country as it is in Europe, it will be necessary to provide some mechanical means of gaining altitude at several places. The funicular and the suspended cable car are not practical in New England because they would be used only week-endsd for two or three winter months and a few summer months. This would mean about 50 days of year of capacity operation and would probably not warrant the investment, unless the project were built or subsidized by some division of the Government. The rope hoist, although it is still in the experimental stage, has already proved its worth. Last winter several such machines were operated on practice slopes. Skiers flocked to them knowing that there might be a mechanical failure during the day but willing to wait many turns in line in order that they might have the downhill run without the tedious work and time required to climb up again. Eventually there will be many rope hoists on practice slopes because they are easy as well as inexpensive to build, and can be made dependable. But how many of us are going to be satisfied with a short run over the same course time and time again. The practice slope has been and always will be popular with the novice, but every winter sees a class graduate from these slopes to the mountain trails. How enjoyable our day would be if we had our choice of two or three trails which hoists would enable us to run every quarter or half hour? One attempt in New England to make this type of skiing available is the Mt. Gunstock Ski Hoist 5 miles east of Laconia, NH. The construction and operation of a long tow brings up many intricate problems which can be solved only by experiment. Mt. 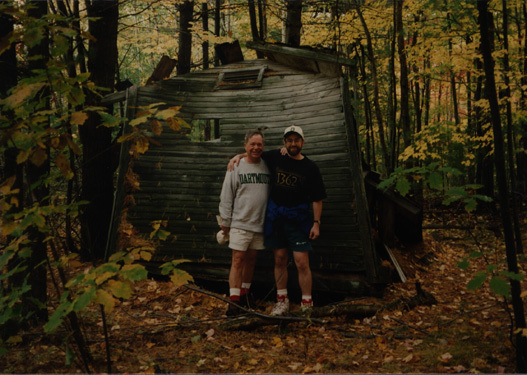 Gunstock was chosen for the location because it was a small mountain with good trail possibilities and near Boston. Also, every mountain cannot be adapted to a ski hoist. The tow trail is of necessary straight and must be concaved over its entire length. The brows, or places where the rope bears down on the ground, must be cut off by digging or blasting and the hollows must be filled or bridged so that the rope will not be over the rider's head. It was difficult even on Mt. Gunstock to find 3100' in a straight line that did not require a prohibitive amount of work to grade. The driving unit is a 40 horse power gasoline engine connected by a roller chain to a gear transmission. The driving sheave is triple grooved and can be disconnected from the engine by a clutch. The rope is endless sliding on the snow going up and returning down the mountain in pulleys to eliminate friction. Unfortunately hemp rope stretches and twists. In our total of 3100 feet of rope the slack amounted to 150 feet but this was satisfactorily taken care of by counterweights. The twists eventually worked out, but something should be developed to take the twists out of a new rope the first time it is run. It is practically impossible to ride over 1000 feet without some means of gripping the rope mechanically. The handle developed at Mt. Gunstock seems to be the answer to this problem as women and children are able to make the trip. A great deal was learned last winter about conserving the rider's endurance. It will be necessary before another winter comes to bring the hoist trail to a more perfect grade, as the rope bore down heavily at several places and it was often necessary to dodge obstacles in the trail. The summit sheave is to be raised 12 feet so that the rope will remain in the air about waist high for the last few hundred feet. This will relieve much of the fatigue and assist the rider in dropping off at the summit. The old ski trail on Mt. Gunstock is partly third class, partly novice. It has always been popular. Last winter one of the finest and most picturesque second class trails in NH was cut on the mountain. Next fall a contour trail will be made from the summit frame of the hoist to the second class trail, giving the runner practically all of the trail without any of the uphill work. Around the mountain to the east, at about the same level as the summit frame, is a 1200' slalom course that has not yet been fully appreciated by the skiers. North from the hoist on the east slopes of Mt. Rowe, one of the best ski jumps in the country is being constructed. This is a gift to the skiers by the ERA. It is hoped that before next winter a new third class trail will be cut to tap the present trail just about the summit frame and descend the mountain on the north side of the hoist trail. When this is done, Mt. Gunstock should be a skier's paradise.